The new single by Taylor Swift called “We Are Never Ever Getting Back Together” is currently topping the iTunes charts in 25 countries. It’s a guarantee that a new record digital sales debut will be marked in next week’s Billboard chart. The popularity of the song was obvious in the first 2 hours after release. That’s how long it took to reach the top of the iTunes chart in USA. In addition, it is also the number one selling song in Canada, Finland, Brazil, Australia and 20 other countries. “We Are Never Ever Getting Back Together” might end up selling 450 to 500 thousand copies before the week is over, according to Billboard. This would make the single the best debut ever for a digital song recorded by a female artist. The current record is held by Lady Gaga with 448,000 downloads for “Born This Way”. Taylor Swift may be just 22 years old, but she has already managed to sell over 17 million albums in USA alone ever since 2006. She has won ten American Music Awards and 6 Grammies, thanks to top hit songs like “Mean” and “You Belong With Me”. 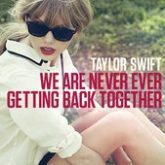 “We Are Never Ever Getting Back Together” is the first single released from the album “Red”, which is scheduled for an October 22, 2012 release date. The single is available for ordering now on iTunes for $1.29 and on Amazon for 99¢. Swift put out a lyrics video, posted below. Do you love it? Leave your comments below!